Business, legal, and technical trends in architecture are constantly changing. The Architect's Handbook of Professional Practice has offered firms the latest guidance on those trends since 1920. The Fifteenth Edition of The Architect's Handbook of Professional Practice includes access to a website that contains samples of all AIA Contract Documents (in PDF format for Mac and PC computers). 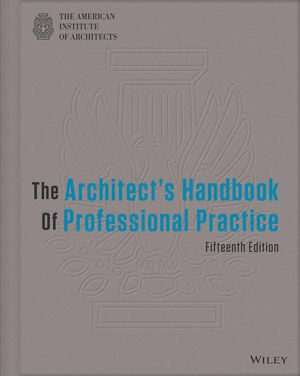 With comprehensive coverage of contemporary practices in architecture, as well as the latest developments and trends in the industry, The Architect's Handbook of Professional Practice continues to be the essential reference for every architect who must meet the challenges of today's marketplace with insight and confidence.